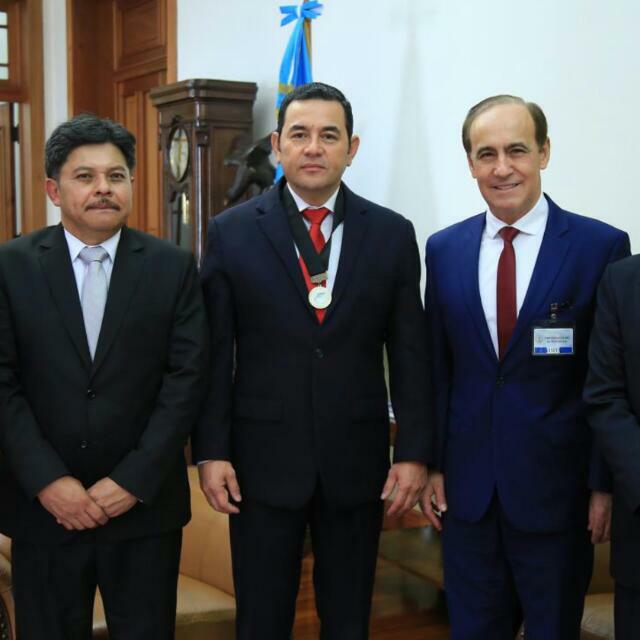 On Wednesday, March 13, 2019, Pastor Robert Costa, speaker/director of It Is Written’s Spanish-speaking ministry Escrito Está, visited the president of Guatemala, Mr. Jimmy Morales, to express Escrito Está’s commitment to sharing Jesus and to pray for him in his role as the country’s leader. Pastor Costa gave the president a brief report of what Escrito Está and local churches have been doing in the areas of education, health, spirituality, communications, and social work to relieve the needs of Guatemala’s citizens. Pastor Costa was warmly received by the president and gifted him and other members of the government a favorite book about the life of Jesus, The Desire of Ages, another devotional book, and an Ambassador of Peace medal. Toward the end of the meeting, Pastor Costa prayed for God to lead and bless President Jimmy Morales and his country. The meeting was made possible thanks to the president’s butler, who is familiar with Escrito Está and connected to local churches in the area. It is the second time Pastor Costa has met with local government officials in Guatemala, as the local church seeks to reach people in all levels of society with a message of hope in the second coming of Jesus. Pastor Costa was in the country to celebrate Escrito Está’s 25th Anniversary and held a series of meetings entitled, Un Futuro con Esperanza (A Future with Hope). The meetings concluded with 210 baptisms. Guatemalan President Jimmy Morales, center, poses for a photo with Pastor Robert Costa, right, and his butler, left. During his March 13 visit, Pastor Costa gave President Morales an Ambassador of Peace medal. You might think that a young man with money, fame, and the adulation of thousands (or millions) of people would be the happiest person on earth. Living the dream, wealthy beyond imagination, hot and cold running everything… What’s not to love? Evidently there’s a lot not to love. Earlier this year, Adam Silver, the commissioner of the National Basketball Association commented on the mental health of professional basketball players. He said, “What surprises me is that they’re truly unhappy.” He explained that there are “pervasive feelings of loneliness and melancholy across the league” and stated that many players are lonely. “If you’re around a team in this day and age, there are always headphones on,’’ Silver said. “[The players] are isolated, and they have their heads down.’’ He reported that one player said, “From the time I get on the plane to when I show up in the arena for the game, I won’t see a single person.” Mr. Silver’s comments were reported on boston.com. There are several factors at play here. One is that social media and electronics allow people to very easily become isolated. A generation ago it wasn’t possible to put earbuds in and separate yourself from what was going on around you, whereas today it’s not only possible but extremely common. Smart phones allow people to immerse themselves in another world, away from the reality of what’s happening in their presence. For these and other reasons, young men at the height of their professional powers are miserable, not happy. If he’s right, then loneliness and isolation and melancholy are a “generational issue.” Put another way, mental health challenges are a “generational issue.” But if young adults earning millions of dollars a year can’t find happiness, who can? Of course there’s nothing inherently wrong with earning large sums of money and enjoying professional success. But the Bible and society tell us that these things aren’t the key to happiness. 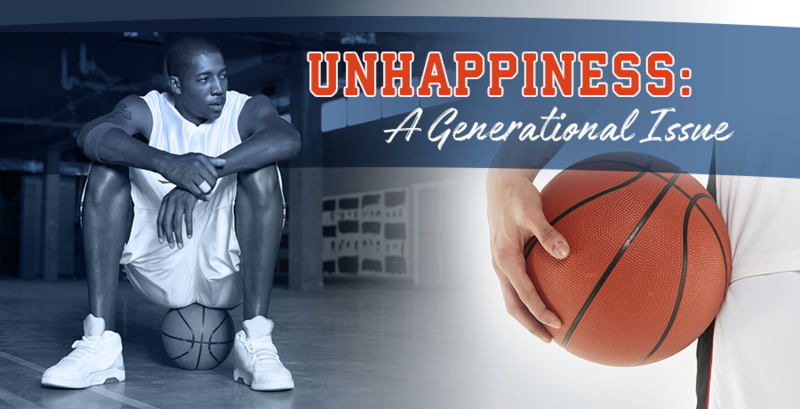 They may even be major contributors to unhappiness. Real happiness comes from oneness with God. Paul wrote in Romans 5:1, “Therefore, having been justified by faith, we have peace with God through our Lord Jesus Christ.” The person whose sins are forgiven has peace in his or her heart. The one who understands the love of God experiences a deep-seated joy. The one who knows he or she is living out God’s purpose is a person who has a settled existence. Be sure you’re taking time for God. The knowledge that God has your heart gives you the certainty you need to live with meaning and hope. If you are experiencing mental health challenges, please seek professional help. Of all the women on Earth, Mary was chosen to bear and raise the Savior of the world. Although she was not wealthy, well-educated, or privileged in any earthly way, spiritually, she was just who God needed to help guide Jesus into His years of public ministry. Some of the best advice Mary ever gave was to a group of servants at a wedding feast in Cana. In a time of crisis, she pointed them to Jesus and said, “Whatever He says to you, do it.” That’s some of the best counsel that has ever been given. Caring, humble, dedicated, and supportive, Mary was handpicked by God. Do you want to make a life-changing impact on a child’s life? 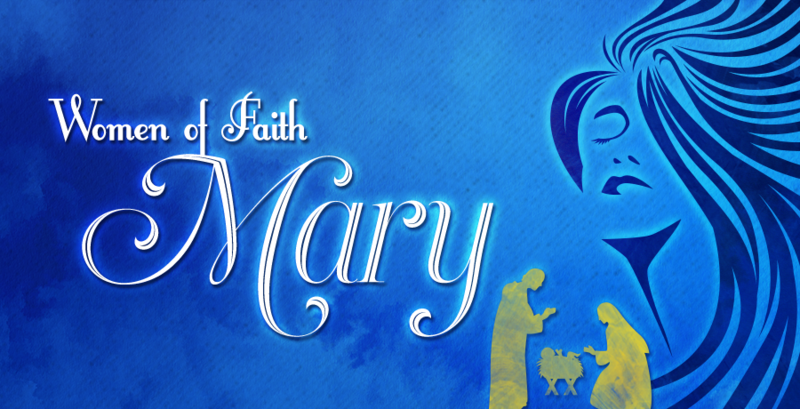 Be inspired by Mary, a woman of faith. Read about Mary in Luke 1 and John 2. 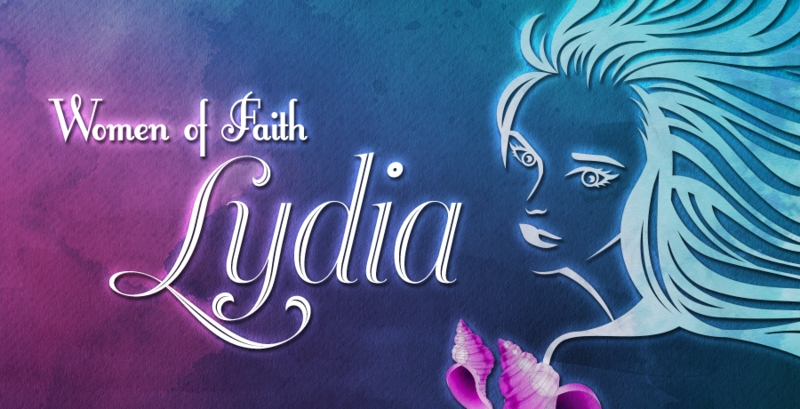 This is the fourth in a series of posts honoring women of faith for Women’s History Month. His smile showed he had something special to tell me. I asked him what he did to reach people with the gospel. Twenty-one souls in five years! There are many churches who haven’t won that many people to Christ in that period of time. And here is one faithful church member who is bringing people to faith in Christ. I wonder what the church and the world would be like if more people had that kind of dedication to Christ. If Jesus really exists, and if He’s really coming back to this earth soon, then sharing Him with others has to be absolutely the most important thing that we could do. 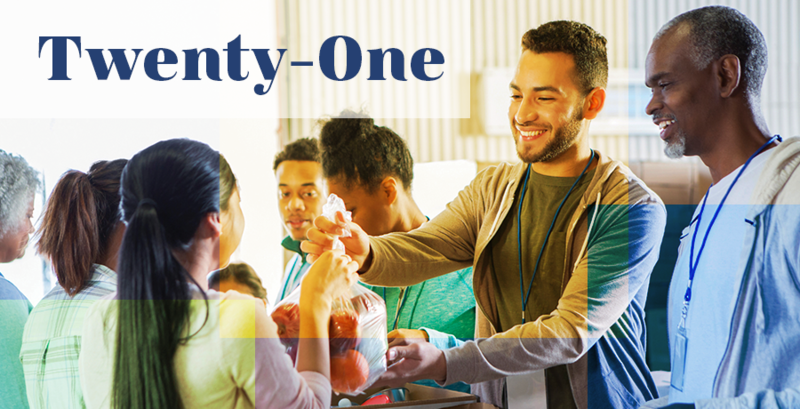 I expect that if my new friend has brought 21 people into the church—to faith in Jesus—then there are many others he has reached out to but who haven’t made decisions for Jesus yet, who said no. Clearly his focus is not on what he has not been able to do, but on what he has been able to do. And he is encouraged to continue on. Is Written. In the message, Jeff shared 10 simple ways that any person can share Jesus with others. I think the sermon could revolutionize the church, and I’m certain it will be a blessing to you. Click the play button below to hear a sermon that could change your life. Jesus is coming back soon. It’s our privilege to share that good news with others. Abigail was the beautiful, kind, and intelligent wife of Nabal, a harsh and evil scoundrel. When David’s men protected Nabal’s shepherds in the wilderness, Nabal repaid David’s kindness with rudeness and disdain. David allowed his anger to get the best of him and purposed to destroy all the males in Nabal’s household. When Abigail heard of David’s plan, she gathered together a feast for David’s men and hurried out to meet him. Courteous, generous, beautiful, and decisive, Abigail entreated David to spare her family. The blessings she spoke touched David’s heart, and when Nabal died shortly thereafter, David took Abigail as his wife. Are you facing a crisis in your life? Are other people’s actions causing you to fear for the safety of your family? 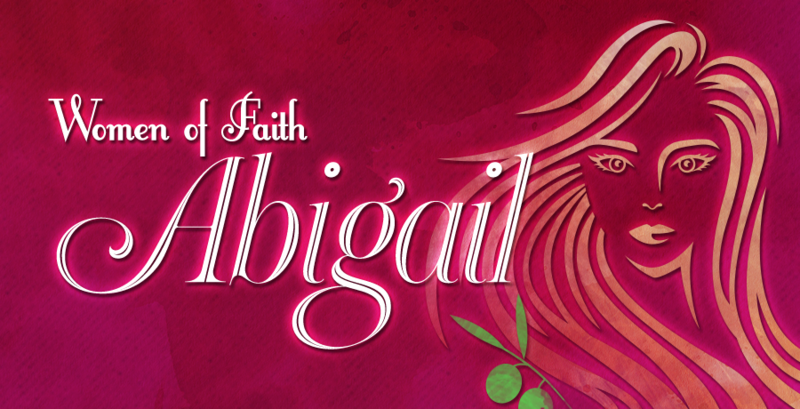 Be inspired by Abigail, a woman of faith. Read her story in 1 Samuel 25. This is the second in a series of posts honoring Women’s History Month. “There was a famine in the land.” Thus begins the story of one of the most inspiring women in the Bible. Ruth, a Moabite widow, experienced tremendous tragedy and loss. But despite the challenges she faced, she knew she had found the God of heaven and refused to let Him go. And your God, my God,” she told Naomi. Faithful. Determined. Caring. Tenacious. And part of the lineage of Jesus. Are you facing challenges in your life today? Are you wondering how all of this can be part of God’s plan? 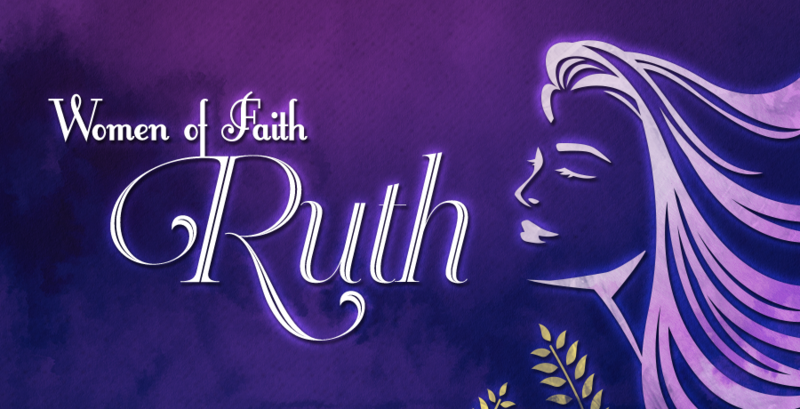 Be inspired by Ruth, a woman of faith. Read her story in the book of Ruth. This is the first in a series of posts honoring Women’s History Month. Have you ever wondered what it might be like to step back in time? Perhaps you jet back 2,000 years and find yourself in a Jewish village hamlet of Jesus’ day? When He showed up in town, the quietness was broken. The desperate poor rose from their squalor. They pressed into His presence for the healing they could secure in no other way. Would you fear to feel the press of that desperate crowd, each anxious he might miss the hoped-for healing? A time machine is not required to be launched into a similar time and place. 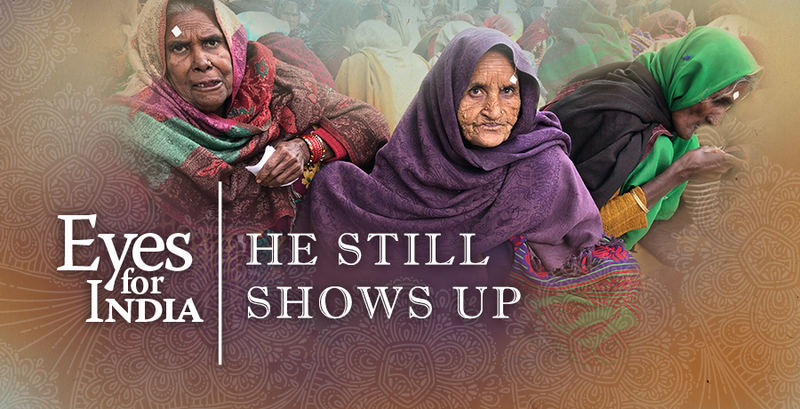 In January, I found myself in the unfolding light of dawn in the Indian region of Uttar Pradesh. As shadowy figures took form around me, I knew I was seeing what Jesus saw and feeling what He must have felt. I wished He was here to touch the lives that flowed passed. 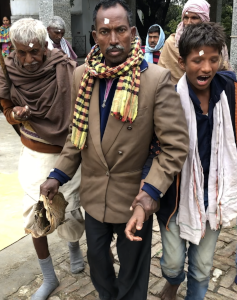 Grandfather, father, and son make their way to the camp to receive eye surgeries. Three men move quickly through the morning mist. One weather-beaten, one middle-aged, and the last a lad of only 10. Opaque eyes tell of his darkness since young. In the cataract belt of India, it is too frequent that young children are born with or develop cataracts at an early age. The lad sweeps his head to and fro. Perhaps he’s listening to the murmuring world about him. 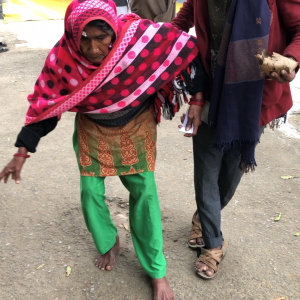 Because the middle-aged man had cataract surgery in one eye already, he steers this train of three skillfully towards the clinic door where It Is Written is sponsoring an eye camp. Today all three men will be operated on. Grandfather will see for the first time in 10 years. Father will gain sight in his second eye. And our doctor hopes the young lad is not too late to recover some sight. No one knows if his brain will know how to see once the obstruction to light is removed. If only he had come sooner. Two women eat before heading home from the eye camp. Next to the Hindu temple a short distance away, I see another soul. I notice she’s bent low over a leaf-plate stitched together by thin twigs. 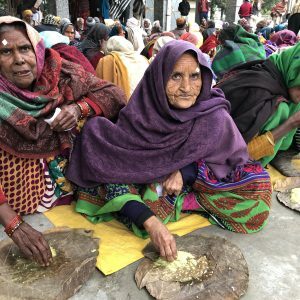 The fingers of this frail woman scoop lentil mush into her hungry mouth. There are 200 others eating just as she is. They have all had eye surgery yesterday. When the sun rises higher, they will head home, excited about recovered sight. When the small heap of nourishment is gone, she folds this disposable plate, rises to throw it away, and washes her hands. Suddenly her slight frame stops when she unfolds to her waist. I inhale sharply. Osteoporosis has robbed her of height. Her entire world view is the earth beneath her feet. She is forever locked into this boomerang-shaped stance. If only the healer was here to cure more than just her sight. A woman shuffles down the street. Osteoporosis prevents her from standing upright. I turn to the sound of shuffling. I see a blind lady’s anxious feet sweep the unfamiliar road as she haltingly gropes her way to the clinic. I wonder how far she has come. Some I’ve spoken to have traveled a day and a half by train. The milling crowd parts to let this stumbling woman through. Hope is within reach. The sticker above her right eye indicates one blinding cataract will be removed. Tomorrow faltering feet will move with solid determination homeward. A woman with cataracts receives assistances as she navigates through a crowd in Barabanki, India. The crowd continues to flow past. How is it possible there are so many? Poverty has treated each cruelly. The want of proper food has left their eyes to suffer. The want of money has delayed them in seeking and securing a cure. But now they are finally here, each with hope for a better tomorrow. I have been told they arrive in waves of 400 plus each day. By the end of the 10 days scheduled for this camp, at least 4,000 will come seeking help and over 2,000 will receive their sight again. I wish Jesus was here. A smile nudges my feeling of helplessness. Jesus is here. In the form of His friends, He has shown up in town today. 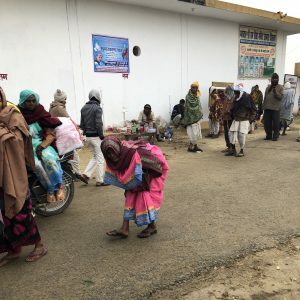 Through the eye camps sponsored by It Is Written and the faithful work of Dr. Jacob Prabhakar and his team, the desperate poor can gain the healing they could secure in no other way. I’m not afraid to feel the press of this desperate crowd, each one anxious he might miss the hoped-for healing, because I know there is help beyond that clinic door. Through the hands of sacrificial donors, the surgeon, dedicated nurses, and numerous volunteers, Jesus is certainly here. There is hope for tomorrow. Click here to learn more about Eyes for India. If you’re under 30 years of age, you’re far more likely to recognize them than if you’re over 30. If you’re under 25, the chances of you being familiar with these people increase even further. Nikkie De Jager. Sound familiar? Huda Kattan. Heard of her? They’re all “influencers,” social media sensations who have amassed millions–in some cases, tens of millions–of followers. They’ve built enormous followings who want to hear from them about makeup or fashion or pop culture. 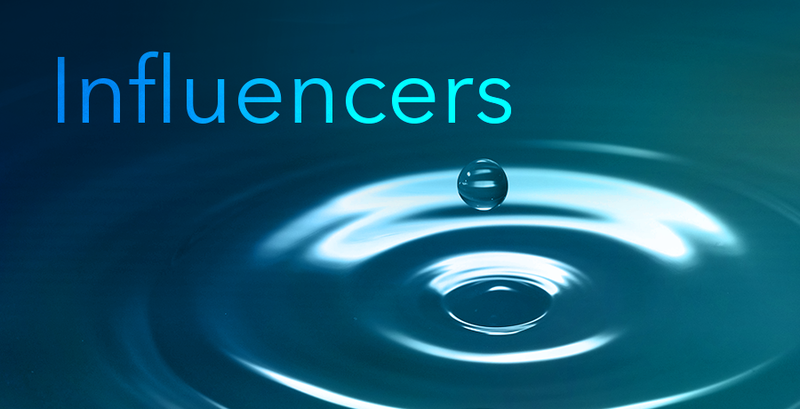 Having access to such a vast number of people means they have a lot of “influence,” which marketers are able to use to promote products or ideas. It’s a new spin on an old idea. Celebrities have been used to sell products for years. OJ Simpson advertising rental cars, Peyton Manning advertising just about everything, and Michael Jordan endorsing basketball shoes are just a few examples of what we’ve become used to seeing. But now there’s a new breed of people–often not (initially) celebrities and often still in their teens–who have a loyal following and who use their influence over that following to affect not only behavior but also their bottom line. But it’s not only social media sensations that have influence. Every person alive has a certain amount of influence over others. It’s not hard to think of individuals who have influenced you during your life. It might be a teacher, an employer, or a quiet, older person you knew at church while you were growing up, someone who affected you with their smile or their gracious words. Influence is power, and it can be a power for good or evil. And while some people–such as politicians, business leaders, and celebrities–influence millions, the rest of us influence people in smaller ways. By how we carry ourselves, how we speak, how we act, and how we respond to others. You don’t even need to talk to influence others. Everyone has had that moment when an angry person storms into–let’s say–a gas station, slams his or her money on the counter, speaks rudely, snatches their change, and stamps out. In that moment, the person in question influenced the room in a very real way. But a gracious person can exert an even more powerful influence whether words are spoken or not. The greatest influencer who ever lived was Jesus. Wherever Jesus went people were influenced by His life and ministry. Sinners were influenced by His patience, kindness, and His love. Religious leaders were influenced by His wisdom, His holiness, and His uncompromising life. When His path crossed that of those who were demon possessed, the influence He had on them was powerful. Acts 10:38 says, “God anointed Jesus of Nazareth with the Holy Ghost and with power, who went about doing good…for God was with him.” While Jesus healed and preached and taught, His ministry would have been of little ultimate effect had he not had such a powerful influence on those around Him. Jesus carried with Him the atmosphere of heaven, which is something anyone can do. I was speaking at a camp meeting in West Virginia when I had lunch with my friend, Jeff Blumenberg. Jeff is the Associate Trust Services Director at It Is Written. He told me that when he last ate at a certain restaurant, he asked the waitress a question as she brought his food. “I’m about to ask the blessing on my food,” he said. “Is there anything you’d like me to pray for you about?” “Yes!” she replied. “I have a big exam coming up in college. I’m nervous. I really need to get a good grade!” Jeff assured her he would pray. She will never forget the kind man who prayed for her. What might have been just another routine meal was transformed into an opportunity to influence someone in the direction of Jesus. And if Jeff had lived in that town, the relationship would undoubtedly have continued and provided him more opportunities to witness and share his faith. How are you using your influence? When someone interacts with you, are they left feeling drawn towards God or… the opposite? God has given you influence. It might not be over millions of Instagram followers. Instead, it might be influence in your home, where you work, at church, with the delivery driver, or at school. With children or grandchildren that influence is great. With the Über driver or the FedEx guy, your influence might be smaller, but it’s still there. You’ve seen what happens when you throw a rock into a pond. The ripples widen and increase, spreading out further and further. Influence is like that. Character is power. The quiet witness of your life carries an influence, a power that reveals to others that Christ lives in you. Use the influence you have to point people towards the God of heaven. ¹ Please note: Mention of these individuals is by no means an endorsement of them or their content.